Does your little princess want to grow up to be a rock queen? She can live out that fantasy this Halloween for only $19.99 (plus shipping and accessories)! On time shipping is guaranteed, shop with confidence. To find Costume Express's very large clearance section, select "Clearance" in the menu bar on the right. After that, you can filter by departments and themes. 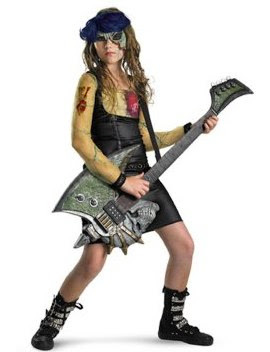 I found the Rocker Child Costume in Kids Costumes. Do you ever feel like your kido is as much fun as a barrel of monkeys? 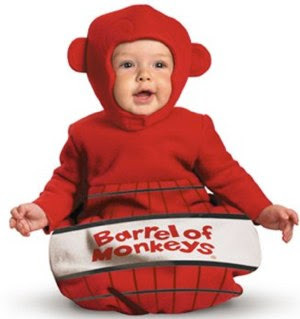 Now your little one can monkey around town with you in this classic costume! Only $9.99 (plus shipping), that’s 67% off! How to get this great costume: Click “Shop by Department”, in the drop down menu select “Costumes” then “Infant/Babies Costumes.” In the left hand side menu under “Categories” choose “Clearance.” You’ll find it the costume in the third row. There are many other great costumes on sale too!